There’s something very appealing to cheap Italian exploitation films. Something about the excess, the bad dubbing, the overblown storytelling or the fact they rip-off classic movies without even an apology. Some are very good, well made pieces of cinema. Sergio Leone’s spaghetti westerns, for example, are classics in themselves and helped change the face of the horse opera forever. Some, like the Italian horrors of Mario Bava, are grotesque and shocking, yet have a mass appeal, while others, like Enzo G. Castellari’s films are so ludicrous and outrageous that you feel a certain sense of comfort in watching them. Yes, you’ve seen them all before, probably the original, yet you come to enjoy the utter nonsense that he employs in the making of his films. These are cheap to the extreme, yet fun at the same time. 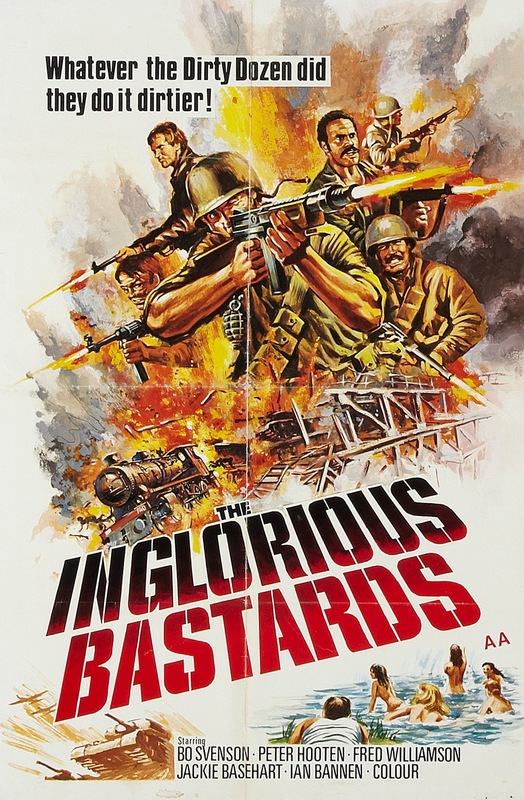 With The Inglorious Bastards, he turns his attention to The Dirty Dozen, although he obviously had to make a cut back version and had the Filthy Five. He also employed B-movie actors who probably you’d recognise as a second player to some other big name star and offered them the leads. So here we get Bo Svenson (a TV actor whose biggest part was playing the lead in the 70s Walking Tall sequels, but not the original) and Fred Williamson (who made his name in Robert Altman’s M*A*S*H and starred in a series of blackploitation films). 1944 France and a group of military criminals are being taken to court when their truck is ambushed by a German plane. Five escape, led by Lt. Robert Yeager and plan to escape to Switzerland and their freedom. On the way they encounter German forces and manage to battle through them until they are mistaken by the French Resistance as expert commando soldiers. Convincing them otherwise, they team up with Col. Charles Thomas Buckner on a dangerous mission to infiltrate a German train to steal the warhead of a new V-2 bomb. Castellari never leaves room for too much explanation but moves quickly from one violent set piece to another, where bodies fly through the air every time a bomb goes off and machine gun fire mixes in with the triumphant musical score. This is where the pleasure comes in, watching these endless battle scenes where the same stuntmen are blown up but from different angles in the vain hope that no one will notice. These little errors pop up throughout, as well as some pretty corny dialogue. I mean, would you ask a German guard if they had chocolate? It’s easy to dismiss these films as tripe but they offer a cheap and shorter alternative to the originals. The Dirty Dozen runs for almost two and a half hours. Here we get a crisp 99 minutes in which we meet the leads, know their standing in the story (the boss, the tough guy, the crook, the nervous wreck, the trouble maker); we get their mission in one simple, fully explained scene and without any prior training of knowledge, the mission is on and within a blink of an eye, it’s over. All the fat is cut out so we get just the raw meat. So the big explosive sequences are obviously models, so the dubbing is bad (not sure why British actor Ian Bannen was dubbed with American though), so it has naked women shooting machine guns for no apparent reason whatsoever, so the film just ends abruptly. These are the things that make it the more enjoyable. Quentin Tarantino is a huge fan of this exploitation cinema. So much so, he bought the rights just so he could use the title for his 2008 war epic Inglorious Basterds. (The film’s storyline, however, was left on the sidelines for a more original plot from QT). These films are massive guilty pleasures that they should be celebrated and not looked upon as inferior. They might not have the budgets or the names of a Hollywood production but they sometimes have more heart and a greater understanding of what an audience really wants.